Big news for owners of the Sony PlayStation 3! 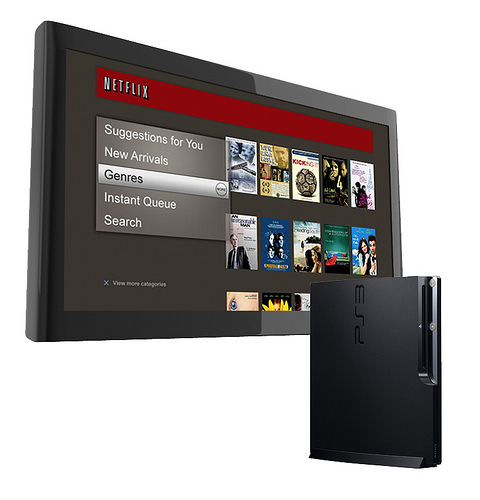 Starting Monday, October 18 the PS3 will offer Netflix through the menu – no disc required! In addition to this great update, the Netflix user interface is also receiving an upgrade for a more advanced browsing experience. The startup and playback will also be sped up compared to the existing disc-based approach. The good news doesn’t stop there! Some content will now be provided in 1080i resolution, with Dolby 5.1 surround sound. Previously Netflix maxed at 720p with 2-channel audio. I knew there was a reason I didn’t sell my PS3. does this mean ALL of Netflix’ library will be available via download? If so, this is huge news. it’s such a drag to have to get the majority of titles shipped to you rather than having the ability to watch them on-demand. i wonder when they’ll roll out this functionality to the Roku box and other devices. No, it has nothing to do with expanded content, it just means that you won’t need a special disc to use Netflix instant viewing on a PS3 and you’ll get higher resolution and surround sound on some titles. For titles that are not available via Instant Viewing, you’ll still need to get them through the DVD by-mail service.